As the Thai Airways jet from Bangkok descended into Rangoon late in the afternoon, I could see the floodplain of the Irrawaddy River delta dotted with farms and an assortment of gold and white temples with majestic stupas protruding above the flourishing vegetation and the mountains in the distance. Rangoon is lush with tropical flora – coconut palms, bougainvillea of a variety of vivid reds, oranges, yellows, whites, and pinks, banana trees, and much more. This lushness adds a pleasant atmosphere often lacking in cities of comparable size, confirming it’s title of “The garden city of the East”. 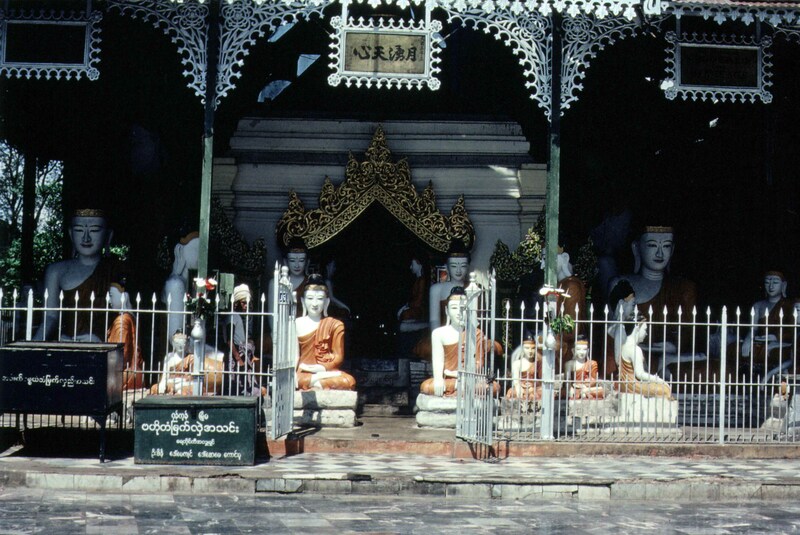 The ancient city is located within the fertile Irrawaddy River delta. 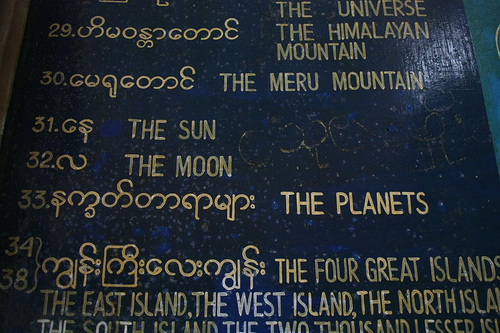 Without guidebooks, we followed common knowledge passed on from tourist to tourist and arrived in Burma well equipped with cartons of 555 cigarettes, bottles of John Walker Black Label and western jeans. These were all valuable commodities of trade in the Burmese black market and could fetch higher rates of exchange than at the government banks. Our booty was quickly bartered with the first Burmese taxi driver we encountered at the airport. I was left with only my tailored made jeans from India, but only for the time being…. The friendly taxi driver navigated his antique car through streets with old and decaying colonial buildings that dominate the central city, interspersed with ramshackle structures. He takes us to his friend’s hotel in the middle downtown Rangoon. It fits our budget but irritates my nose. “Smells like dead cats”, I said to my friend. This is Wendy’s first trip outside of Australia, besides New Zealand where she comes from. “Well, it’s not the Strand. That’s for sure”, she replied. We’re too hot and bothered to do anything about it. The Strand Hotel is one of the oldest hotels in Rangoon of former colonial opulence during the time of British colonial rule. 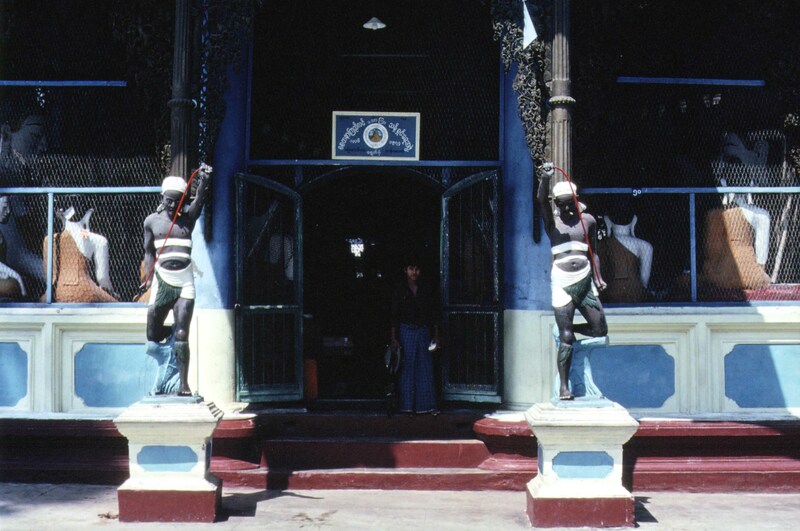 However, in 1982, it wouldn’t have made much difference to have stayed there, except in the price, as all the hotels were government managed and fairly run down in the early ‘80s so we bite the bullet and make the most of our short stay in Rangoon. 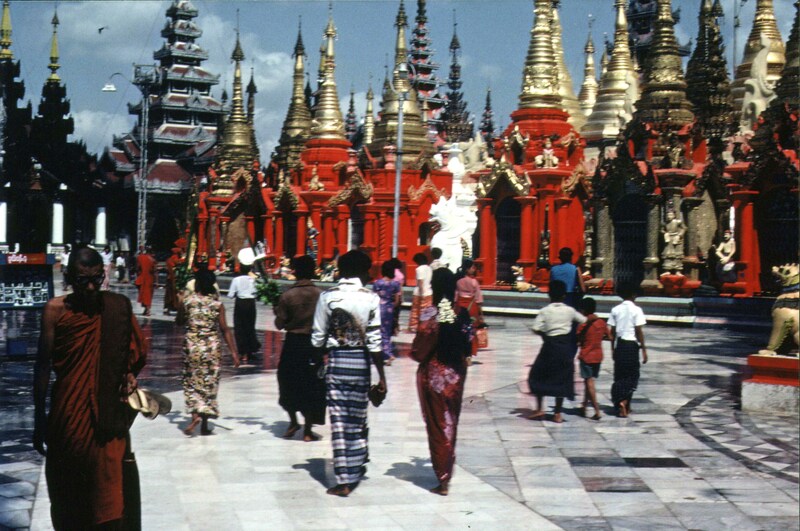 As our plan was to head out of Rangoon as soon as possible, we limited our sight-seeing to only a few places. 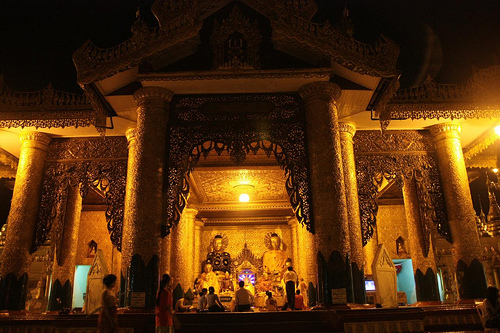 The first attraction we visit is the Shwedagon Pagoda. 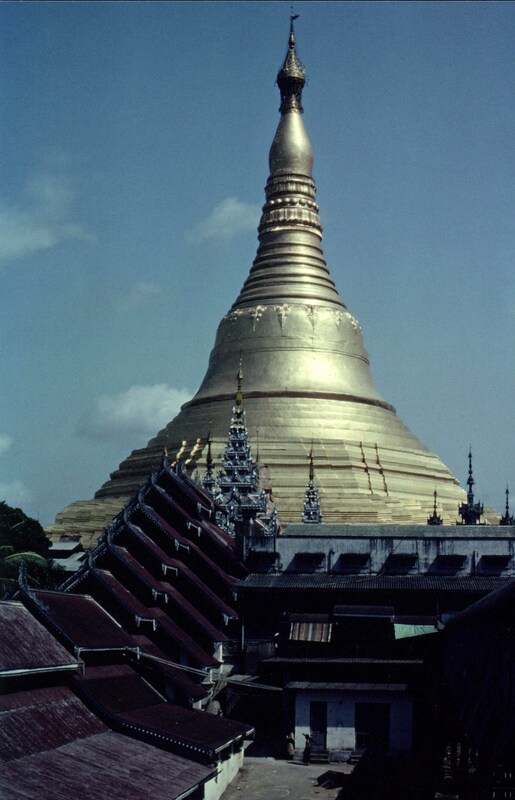 Over 400 feet tall and sheathed in no less than nine tons of gold, the pagoda is crowned with over 5,000 diamonds, and 2,000 rubies, sapphires, and topaz, with a huge emerald on its topmost spire. Regarded as one of the wonders of the world, it was first began over 2,500 years ago and completed in the 1800s. To gain merit (an integral part of Theravada Buddhism), locals come here to wash the images of the Buddha and to sweep the floor. Hundreds of smaller pagodas surround the large Shwedagon Pagoda. 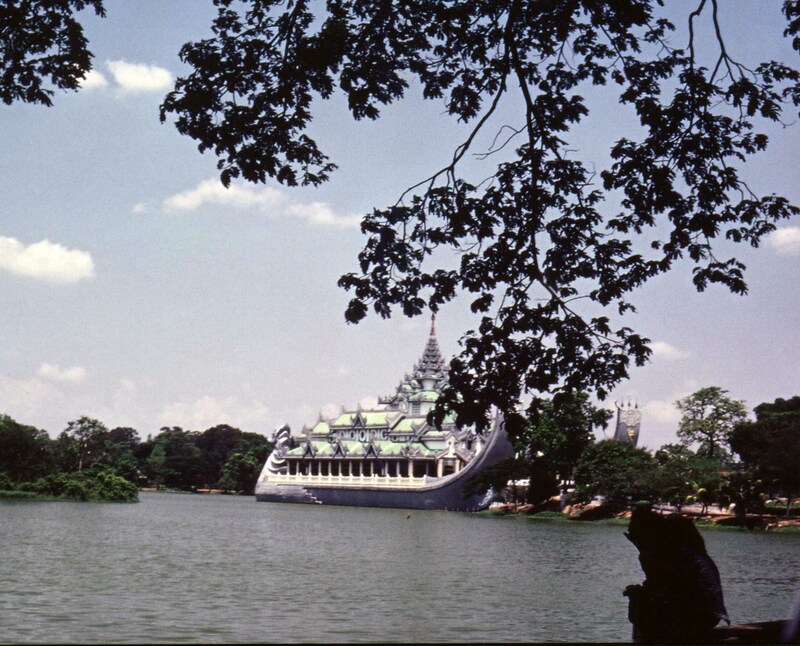 A short distance beyond the Shwedagon Pagoda is the Chaukhtatgyi Pagoda housing the largest reclining Buddha in Burma, if not in the world . This figure is about 6 stories long and 2.5 stories high at head height. This Buddha has 108 distinguishing marks or sacred symbols on the soles of his two huge feet. 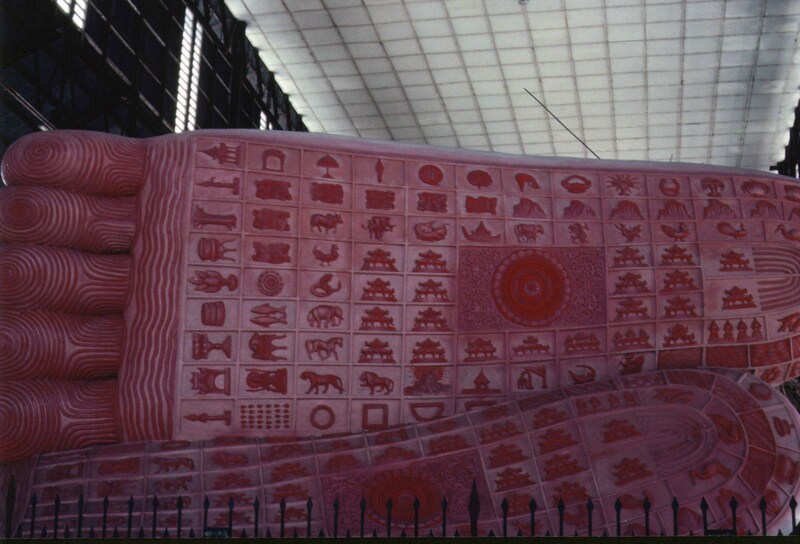 Each mark describes the life of Buddha before attaining enlightenment. 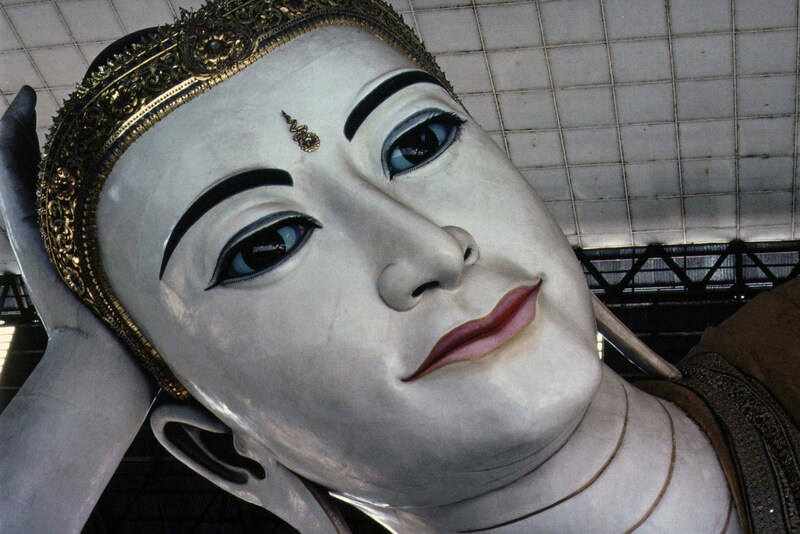 The Chaukhtatgyi Buddha is revered as one of the most beautiful reclining Buddhas in Burma, particularly his smile. The crown on his head is studded with diamonds and precious gems. Did I mention that it was Buddhist New Year when we arrived? In Theravada countries (Thailand, Burma, Sri Lanka, Cambodia and Laos), the new year is celebrated for three days from the first full moon day in April. The Thingyan Water Festival in Burma can last 4 to 5 days. Traditionally, Thingyan involves the gentle sprinkling of scented water in a silver bowl using sprigs of tha byay (Jambul), a practice that continues to be prevalent in rural areas. The sprinkling of water was intended to metaphorically “wash away” one’s sins of the previous year. What really happens is that people use garden hoses, huge syringes made of bamboo, brass or plastic, water pistols and any other devices from which water can be squirted, in addition to the traditional bowls and cups. Water balloons and even fire hoses were used! It is the hottest time of the year so a good drenching is usually welcomed by most. 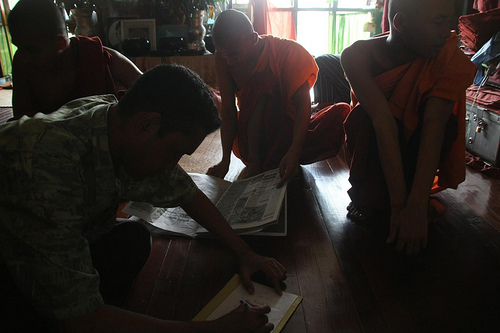 Everyone is fair game except monks, pregnant women and passengers traveling in rickshaws. We encountered the occasional rowdy water-bashing skirmish with some local youths in the back lane near our hotel. Not surprisingly, these outbreaks caused my red-headed Kiwi friend to run off shrieking and yelling Aussie abuse, to everyone’s great amusement. Having lived in Northern Thailand for the previous year, I knew that it was all in good fun! Below is a short video of how the Burmese celebrate New Year in Rangoon today. Being the Buddhist New Year however did present other difficulties. We found many shops and attractions closed for the long holiday. For this reason, we were not able to have a meal at the famous Karaweik Royal Barge floating restaurant on the lake. Instead, we enjoyed walking around the surrounding lovely gardens and meeting the locals. Our Rangoon sight-seeing finished, it was time to get on with the serious business of buying our train tickets for Mandalay. The main purpose of this trip for me was to explore Burmese culture as background for the research I was conducting at the time in Lampang, Northern Thailand. So what happened to Rangoon? 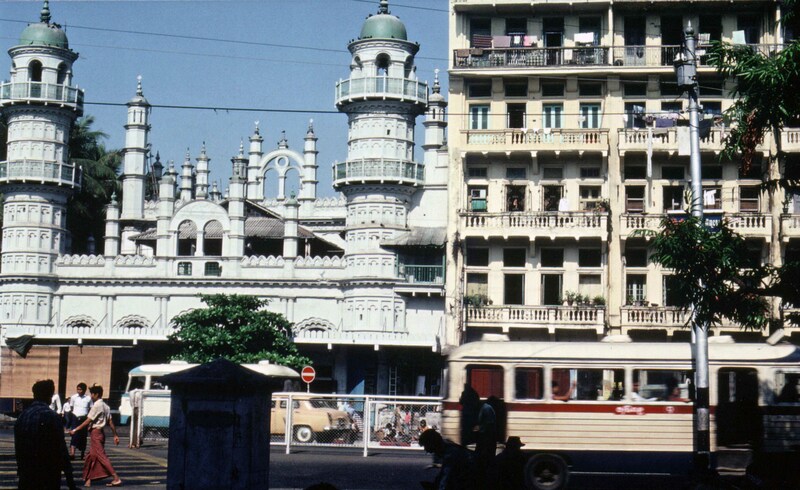 In 1989, the military junta changed the city’s English name to “Yangon”, along with many other changes in English transliteration of Burmese place names. The changes have not been accepted by many Burmese and other supporters of the democracy movement in Burma, including myself. In November 2005, the military junta designated a new purposed built city of Naypyidaw, 322 km (200 miles) north in Mandalay Division as the new administrative capital. The motives for the move remain unclear. 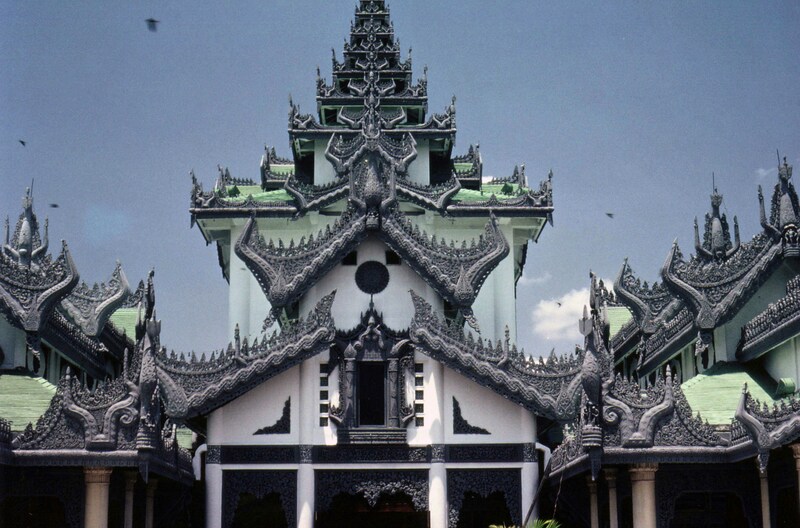 At any rate, Rangoon remains the largest city, and the most important commercial centre of Burma today. 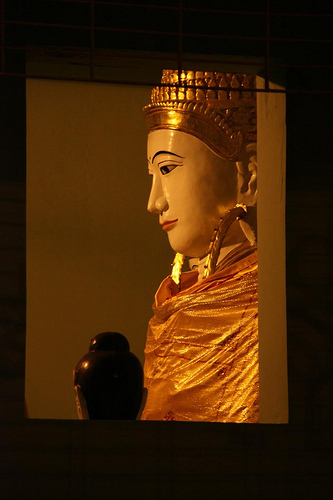 This entry was posted in BUDDHISM, BURMA, Culture, TRAVEL and tagged Buddhist New Year, Burmese New Year, Burmese Puppets, Chaukhtatgyi Buddha, Myanmar, photography, Rangoon, Shwedagon Pagoda, Thingyan, Water Festival. Bookmark the permalink.